Mohanraj was caught in a viral video with two other men, S. Satthiya and contract worker K Ganesh, killing a cat in a dryer at a self-service launderette. According to Bernama, Selayang Sessions Court Justice Rasyihah Ghazali sentenced Mohanraj after he admitted to committing the crime on 17 January. She ordered Mohanraj's sentence to begin from the date of his arrest on 14 September. A. Mohanraj being escorted out by authorities at the Selayang Sessions Court. The 42-year-old taxi driver had originally pleaded not guilty to the crime but on Thursday changed his plea, saying: "I feel regret. I apologise to all Malaysians and I promise not to do this again"
He pleaded for a lenient sentence saying he has a wife and an ill mother to look after and that throughout his detention, he was "ridiculed and insulted by other detainees." However, Selangor Veterinary Services Department (DVS) prosecuting officer Roslan Mohd Isa objected to Mohanraj's appeal, saying that a deterrent sentence was needed to be handed down as it involved public interest, reported NST Online. "As a human being who should be able to think for himself, the accused should be protecting animals as they are defenceless. "(Such actions) cannot be accepted by society," said Roslan, who handled prosecution together with deputy public prosecutor Nurul Ain Shafie. 27-year-old Satthiya was given a discharge without an acquittal for the same offence, while the contract worker Ganesh has maintained his not guilty plea to the charge. 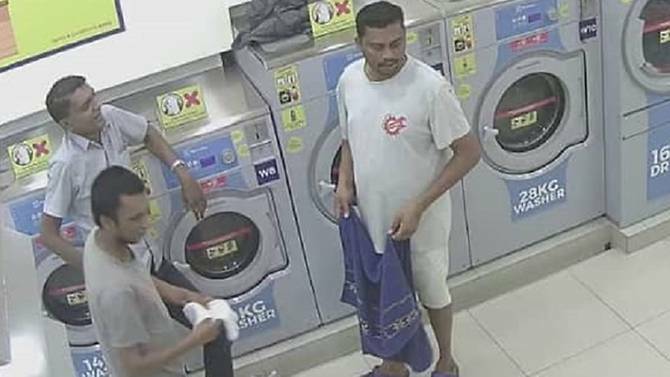 The three of them were caught on CCTV camera at the laundromat in Gombak, placing the cat into a clothes dryer and were seen cracking up at what they thought was funny. As the CCTV footage went viral, their case sparked national outrage. "I am appealing to all Malaysians to be compassionate towards abandoned animals who cannot defend themselves," Tengku Permaisuri Norashikin said in a statement. While satisfied with the punishment towards Mohanraj for his crime, at the same time she was saddened that there were still some incidents involving cruelty to animals such as kittens trampled to death, as well as the poisoning and burning of dogs. He claimed that he has a lot of personal information on the phone.